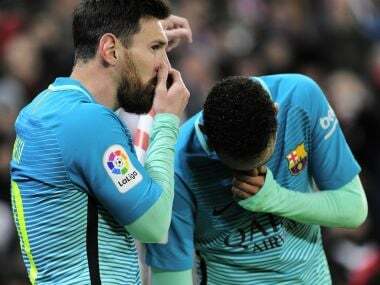 Barcelona's two-year reign of the Copa del Rey was in jeopardy after it lost to a nine-man Athletic Bilbao 2-1 at a packed San Mames Stadium on Thursday. 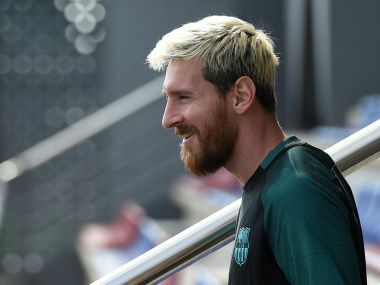 Atletico Madrid host Real Madrid for the last time in La Liga at the Vicente Calderon, while Barcelona host Malaga with an eye on the top spot. 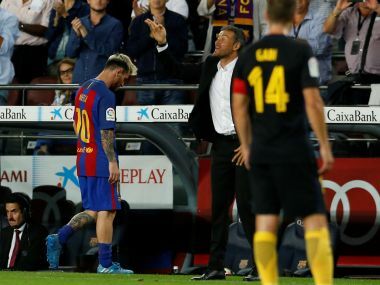 Barcelona coach Luis Enrique expects his team to adapt to Lionel Messi's absence in the same manner as last season when they won eight of their 10 games without the talismanic forward. 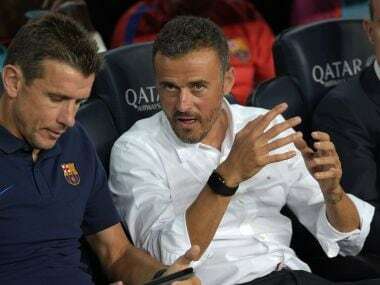 Barcelona boss Luis Enrique admitted he must take responsibility for the Spanish champions' shock home defeat to newly promoted Alaves after starting Lionel Messi and Luis Suarez on the bench. Spain and Switzerland racked up 11 goals between them to qualify for Euro 2016 on Friday as England maintained their 100 percent record. Valencia turned the tables on a stunned Basle side to reach the Europa League semi-finals on Thursday with a 5-0 win after extra time thanks to a Paco Alcacer hat-trick as they recovered from a three-goal first-leg deficit.